Are you looking for an adorable Monogram name design set for your Christmas stitching? 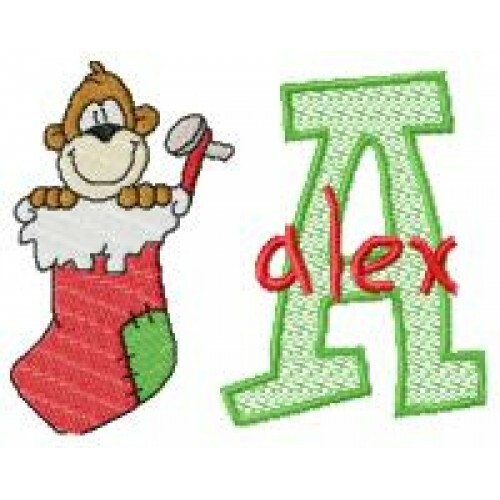 This mega-set contains 26 FUN 2-color uppercase letters approximately 3 3/4 inch, 26 lower case letters approximately 1 1/4 inch as well 7 high quality Cute Stocking Critter designs approximately 3 1/2 inches. All designs fit the 4x4 hoop and would be perfect for gift bags, stockings, winter scarves, bibs, burp cloths! A total of 59 design files in the set. Be sure to check out the Project Showcase section of the site to see how customers have used this adorable set.